This is a complete list of every known descendant of George V, the founder of the House of Windsor, and his queen Mary of Teck. The list includes deceased members, members who have become Catholic, royal and non-royal, legitimate and illegitimate members openly acknowledged by their parents. The table includes generational data and birthdays and image data. The list is more comprehensive than the line of succession to the British throne which is a list of living descendants of George V's sons. CREATION: When the House of Windsor was created in 1917 the only descendants of King George V were his 6 unmarried children, ranging in age from 12 to 23. The death of Prince John at age 13 was the first change. No subsequent child in the Windsor family has been named John. KING GEORGE VI: On 11 December 1936, when George VI became king there were 8 descendants of George V in the line of succession (The King's 2 daughters, 3 siblings, and 3 nephews). A niece was born 2 weeks later. The oldest brother, Edward VIII, was not in the line having abdicated the throne to marry the woman of his choice. ELIZABETH II: In 1952, when Elizabeth II became queen, there were 13 descendants of George V in the line (The Queen's 2 children, 1 sister, 1 uncle, 1 aunt, 7 first cousins, 1 first cousin once removed). During the 15 years and 8 weeks of her father's reign, 6 children had been born and Elizabeth's uncle, Prince George, Duke of Kent had died in a plane crash during the war. This list is complete as of 18 June 2018[update]. King George V, creator of the House of Windsor has 105 known descendants in five generations. Out of the known descendants, 1 is currently the monarch and 74 family members are in the line of succession. Members who are (1) Catholic or (2) illegitimate or legitimated by marriage are excluded by peerage regulations. Spouses are not included in the list. Gen. # Generation Total Dead Catholic Legt. by m.
Most of the first generation of illegitimate children on this table are all legitimatio per matrimonium subsequens or legitimated by subsequent marriage. Under British law, they and their descendants are excluded from the line of succession. In some cases they are also excluded from other titles. Other monarchies are different. Monaco, for instance recognises children so legitimated as eligible for the throne. Suspected illegitimate children not openly acknowledged by members of the family are not included in the table. The Catholics are from three families. Prince Michael married his Catholic wife in 1978, but his children were raised in communion with the Anglican church and are still eligible. The Duke of Kent's (#36) wife converted to Catholicism decades after they were married. Her later conversion did not exclude him. However, his two sons have converted to Catholicism. The oldest son, George Windsor (#37), has 3 children. Only Lady Amelia Windsor (#38) is still in the line, but it is presumed that she will follow the lead of her siblings and parents and be confirmed [in the Catholic faith] when she is older and hence will be excluded from succession. The second son, Lord Nicholas Windsor, married his wife in the Vatican, and his three children are baptised Catholics. The House of Windsor was created from the House of Saxe-Coburg and Gotha (a minor branch of the House of Wettin). Officially, Edward VII was the only British monarch to rule as a member of this house. George V is considered to be a member of the House of Windsor. 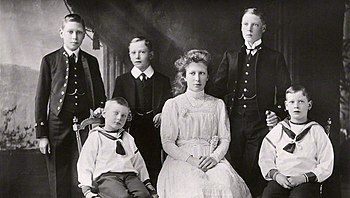 The 6 living descendants of Lady Maud Duff are considered part of the extended British Royal family.